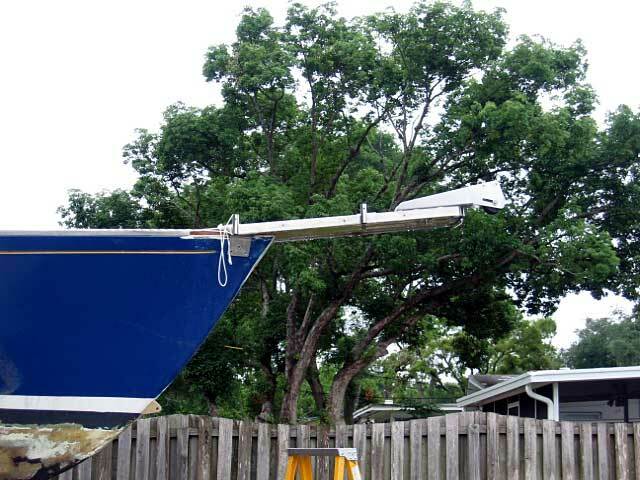 If you read the projects area for the new bowsprit construct you will learn why I built a new bowsprit for this refit. 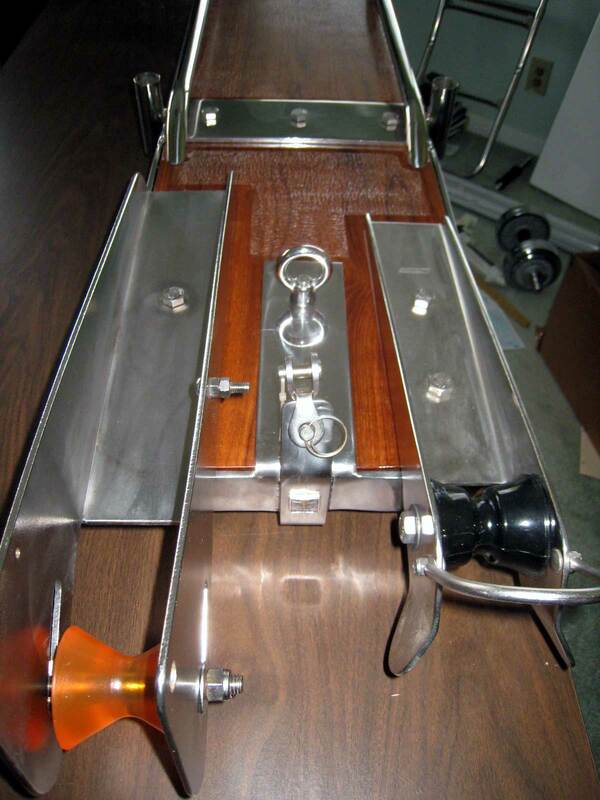 Here it is, test fitted to the boat. The bowsprit is surrounded in a stainless steel brace, or surround as I call it, built for me 14 years ago by Embree Welding in St Pete. They did a masterful job, it has held up very well with a bit of Never Dull. 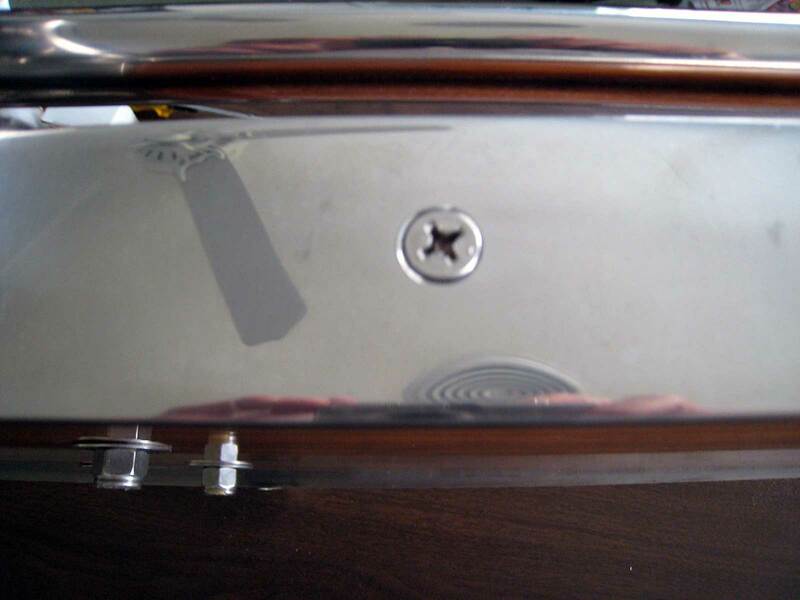 The surround is 3/16" to 1/4 inch stainless. I have two anchor platform rollers mounted: a Windline URM-1 that I have modified to carry my 22# Bruce, and a CRM-1 for a second anchor / lunch hook / storm anchor, etc. 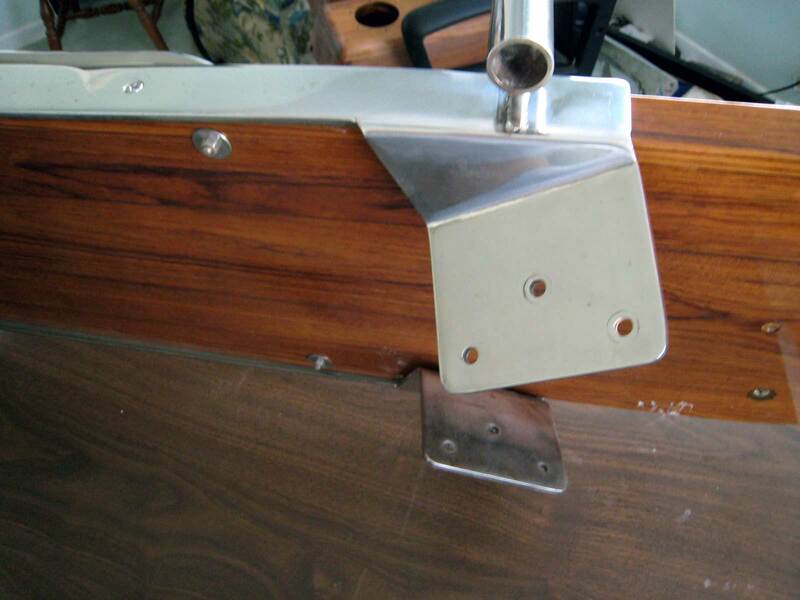 The two Windlines are thru-bolted thru the bowsprit with 316 stainless 1/2" hex head bolts. You can also see I have a an eye nut fastened to the center 1/2" bolt for the surround, to use when flying a drifter or an asymmetrical spinnaker. 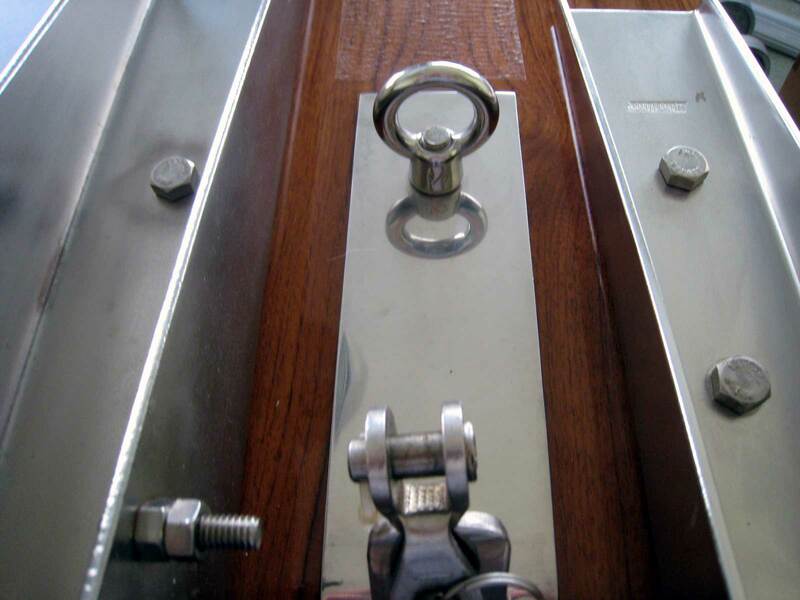 The bolts are backed up to a 1/4 stainless backing plate underneath that provides rigidity and strength to the front of the bowsprit. The combination sandwiches the bow rollers and the bowsprit and provide enormous strength. The URM-1 which carries my Bruce, chain and storm anchoring gear is not only thru-bolted thru the bowsprit, but welded to the surround on the front and side. The forestay tang is bent to the two angles it needs for the forestay and the bobstay and welded to the front of the surround. 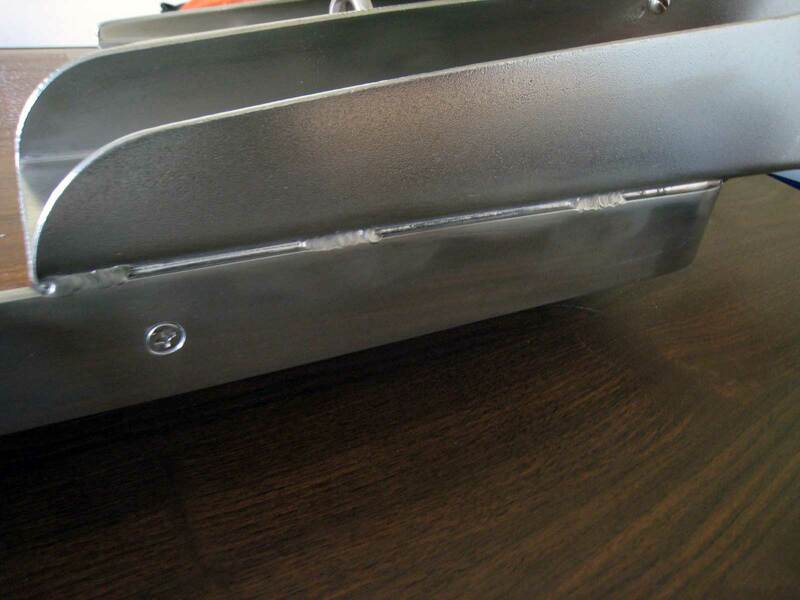 Since it is one piece should the weld ever fail the angles will hold it in position on the surround frame. The bobstay wire is 5/16", one over from the forestay wire. Here is another shot of the two anchor rollers. 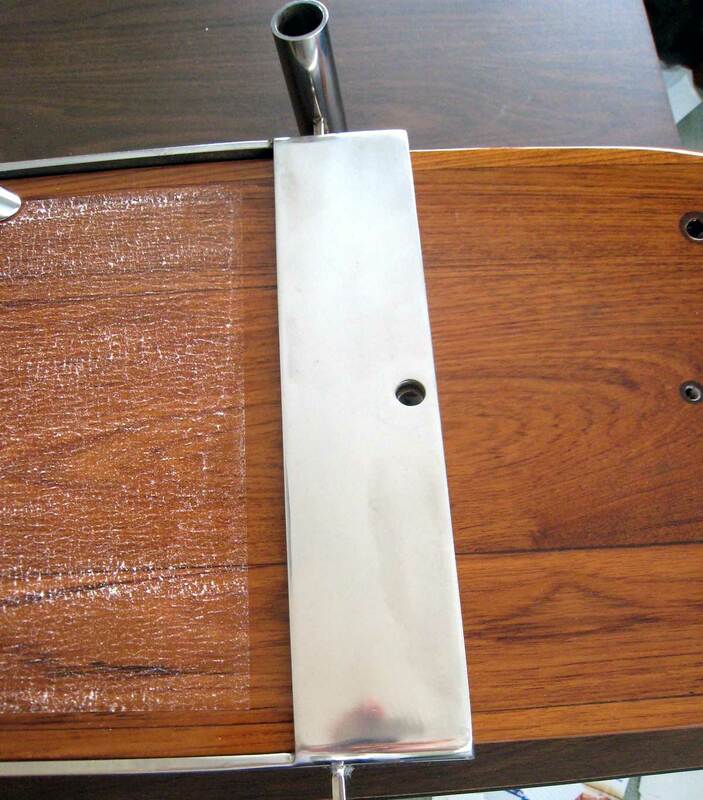 You may be able to see that there is a 1/8" gap between the vertical surround sides and the teak to allow water to drain off the top face of the bowsprit. 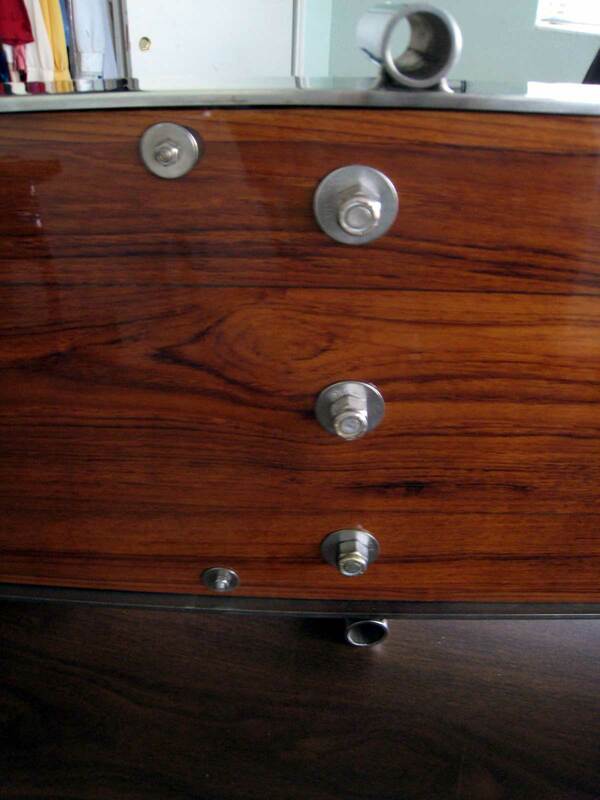 The surround has two cross braces that tie into the side frames. This one is just aft of the anchor rollers. It is mounted with 1/2" 316 stainless hex head bolts. 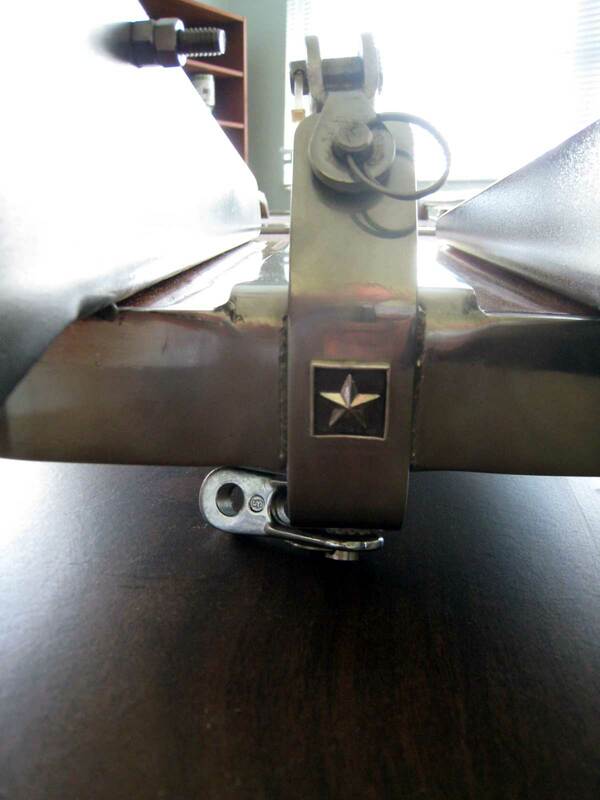 The bolts thru the cross brace are backed up to 316 stainless fender washers and nylock nuts. The second cross brace is further aft. 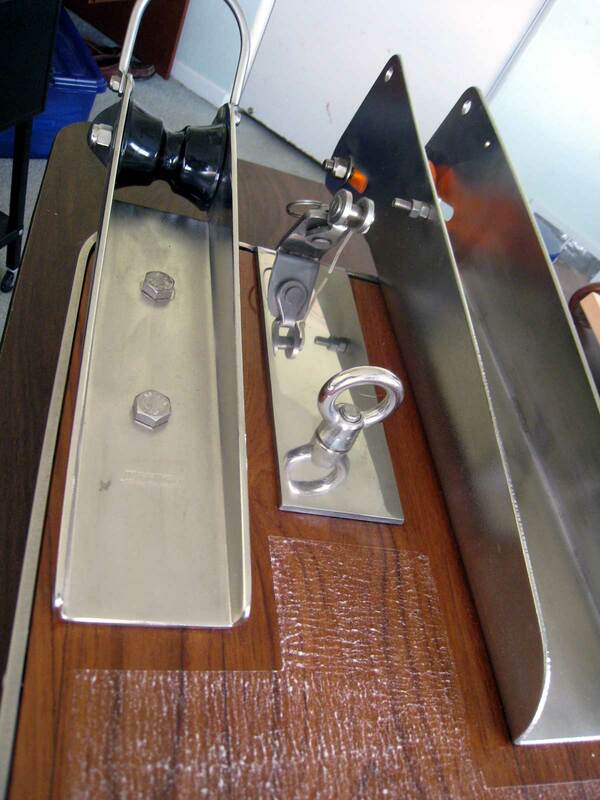 It is fastened again with a 1/2" 316 stainless hex head bolt that mounts thru the bowsprit, thru the foredeck, and thru the teak backing block below in the chain locker. Aft of the cross brace I am mounting a bronze staysail chainplate, fastened with four 5/16" bronze flathead bolts, thru the deck, and thru the teak backing block below. 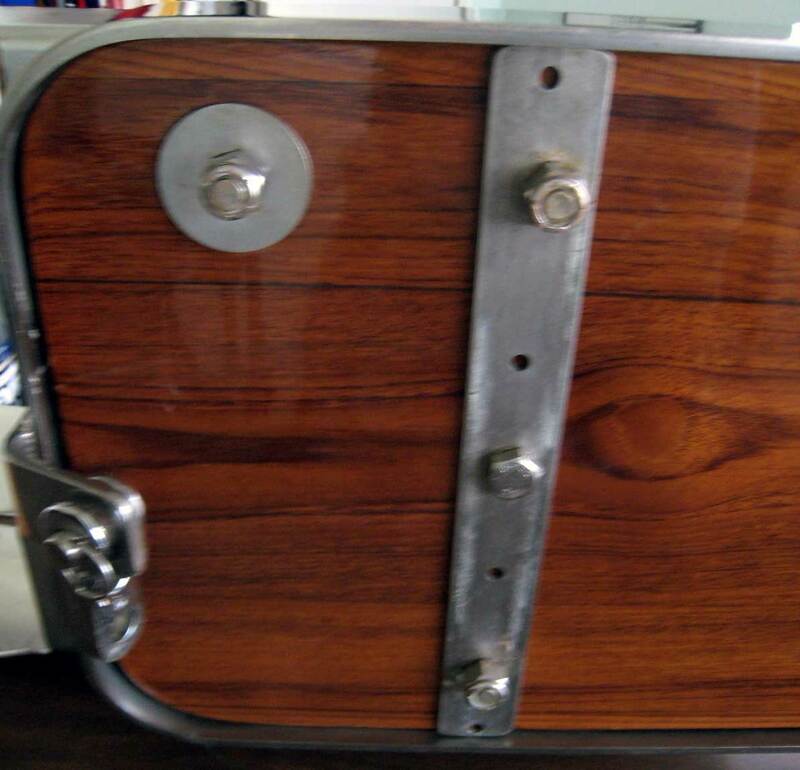 The two holes on each side are for two 1/2" 316 stainless hex head bolts that also mount thru the deck, thru the teak baking block in the chain locker. 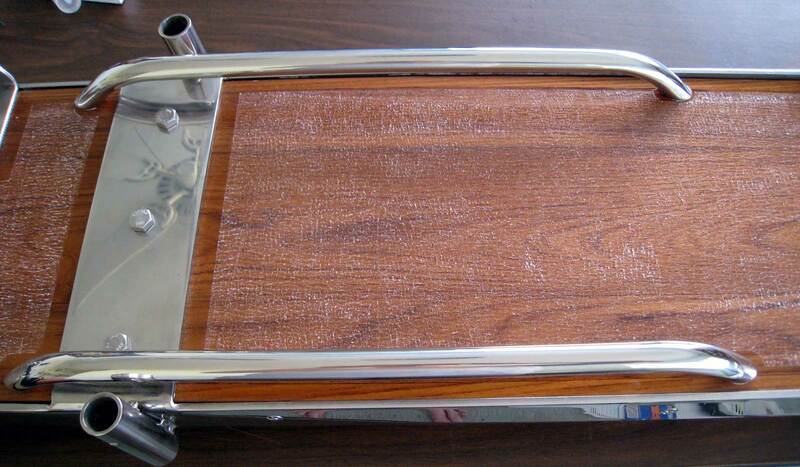 Along the sides I have mounted 24" stainless handrails that match the handrails I am using on the cabin top. The rails are there to brace my feet against when the boat is heeling. They will also be useful if I ever need to crawl out there in my hands and knees (I hope not!) and for tying off lines. 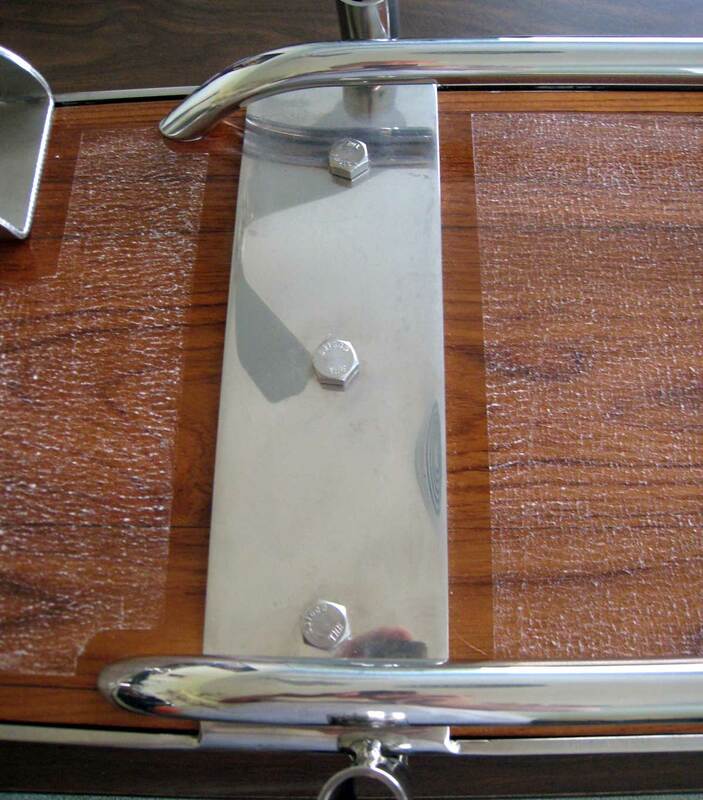 The surround terminates in a beautifully formed cheek plate on each side that creates a pocket for the bowsprit and attaches thru the topsides with a total of six 3/8" 316 stainless hex head bolts. 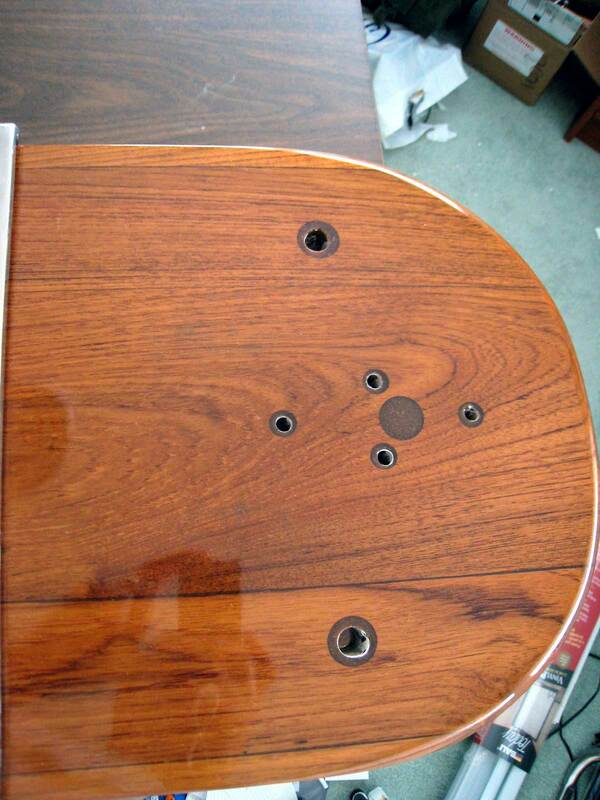 The surround is further tied into the bowsprit with a total of six 1/4 x 2" 316 stainless flat head wood screws.